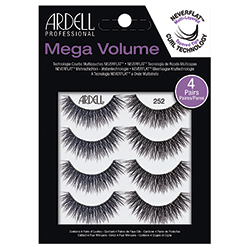 Voluminous lash style with NeverFlat Curl Technology, where lashes are multi-layered with tapered tips to blend naturally with one’s lashes. Lashes appear multi-dimensional for an enhanced 3D effect. 252 Style. Black.